Here are six zoos in both Michigan peninsulas ranked on Trip Advisor. Take a look and see if one of them could be your next great class field trip. The G.T. Butterfly House & Bug Zoo, in Williamsburg near Traverse City, opened in 2014 and has been wowing visitors ever since. Combining education, excitement, and fun, the Butterfly House & Bug Zoo offers free presentations about animals, science and biology, and conservation/stewardship responsibilities; nature walks to learn about native plants and animals; a walk through the lively butterfly house; and insects from around the world, as well as frogs, salamanders, and more! Your class will soon learn you don’t need lions and tigers and bears to have a great zoo! Located in Alto between Lansing and Grand Rapids, Boulder Ridge Wild Animal Park covers 80 acres and contains more than 1,500 animals — exotic and domestic — including mammals, birds, reptiles and amphibians, fish, and invertebrates. The natural habitat areas resemble the animals’ wild environments and the zoo now has an Education Building with hands-on displays that are constantly updated. Check their website for special events, and don’t forget the free Safari Ride to see many larger animals. The Creature Conservancy, in Ann Arbor, is an immersive experience for students from kindergarten to college. Students get both in-depth classroom presentations about interesting and unusual animals, and guided tours of the many unique and beautiful animals on display. The Creature Conservancy began as a rescue group and while still accepting homeless creatures of all kinds, has expanded to provide educational and inspirational programs that promote empathy for and understanding of wildlife and how each living thing impacts our world. Lambertville in southeast Michigan is home to Indian Creek Zoo, which specializes in field trips. The programs educate students as they anticipate up-close animal encounters and more, and are designed for each grade level, so students get the most out of their day. With animals as diverse as goats and giraffes, monkey and emus, Indian Creek is a great zoo experience! For the very daring, pre-arranged camel rides are also available. In the Upper Peninsula, along the northern shore of Lake Michigan, GarLyn Zoo Wildlife Park, in Naubinway offers an exciting animal experience for everyone who loves the exotic and the native. Family run since 1994, GarLyn Zoo has wildlife like ring-tailed lemurs and Siberian tigers as well as water-lovers like river otters and alligators, and the more common dear, goats and llamas. Students can hand feed smaller animals and just enjoy nature in the pine forest setting. Also in the Upper Peninsula, the DeYoung Family Zoo in Wallace near Menominee, has a wide variety of animals from around the world and right here in Michigan. One of its most impressive animal groups is the big cats, as the DeYoung Family Zoo boasts the largest big cat family in the mid-west with more than 40 members! The zoo also provides a well-stocked petting zoo and food can be purchased for feeding the animals. Each of these zoos offers something for every age and promises a great outing for your class. 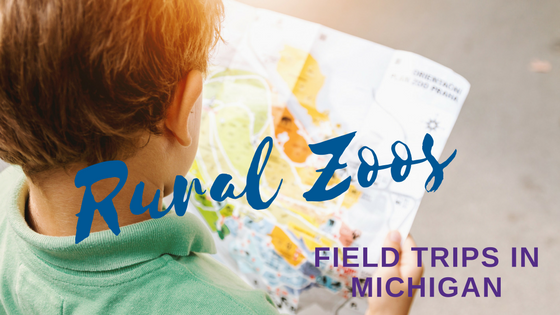 If you're not sold on the zoo, we've got tons of other field trip ideas in our blog, "How to Plan a Successful Field Trip." Indian Trails stands ready to assist and can answer all your questions about chartering a motorcoach for your class. Contact us today!